Between 1959 and 1979, Anthropologica was initially run by the Canadian Research Centre for Anthropology / Centre canadien de recherches pour l’anthropologie at St. Paul University (Ottawa). The journal had acquired a solid reputation, specializing in the study of Canadian First Nations. Anthropologica was transferred to Laurentian University in 1983 and to Wilfrid Laurier University Press in 1989, where it stayed until the merger with Culture. The Canadian Ethnology Society was established in 1974. In 1981, under its current name, the Canadian Anthropology Society began to publish Culture (now the name of CASCA’s electronic newsletter). In 1987, the association changed its name to the Canadian Anthropology Society / Société canadienne d’anthropologie (CASCA). The current series of Anthropologica started in 1998 after the merger of Canada’s oldest refereed journal of social anthropology, Anthropologica, with the Canadian Anthropology Society’s primary journal, Culture. The Canadian Anthropology Society, which owns the combined journal decided to use the name Anthropologica, which had been in existence for 40 years. In March 2013, Anthropologica moved to its new publisher, the University of Toronto Press. Anthropologica’s mandate is to reflect the range of research carried out by Canadian Anglophone and Francophone anthropologists and to disseminate that research within Canada and internationally in both languages. Given that Canadian Anthropologists conduct research in any number of global communities, rural and urban, our current focus extends beyond the traditional coverage of Canadian First Nations to include ethnographic research carried out anywhere in the world by Canadian anthropologists. In this way, the journal provides a more inclusive representation of Canadian anthropology scholarship which encompasses global as well as Canadian issues. We also include ethnographic research from international scholars who conduct research in Canada or who are identified by the editors as having important contributions to make to Canadian readers and to the theory, method and ethnography of the discipline. 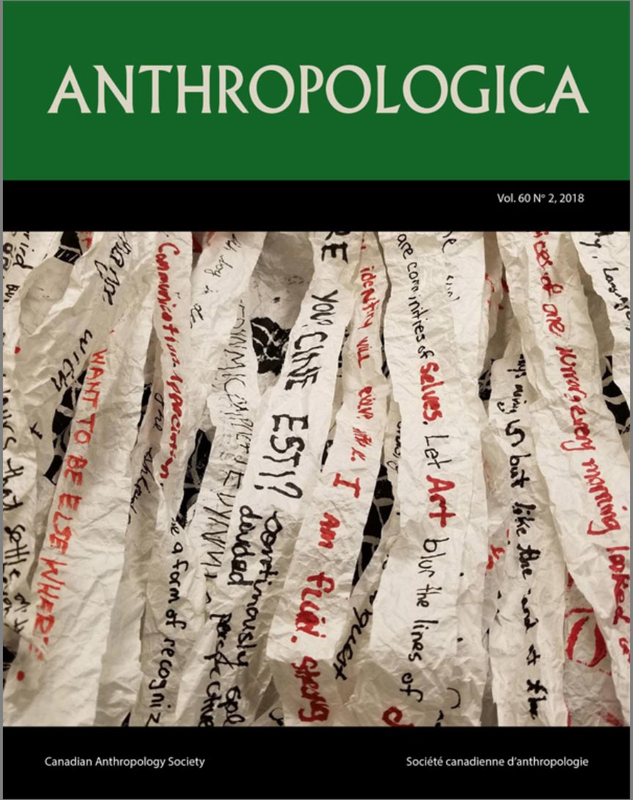 A free subscription to Anthropologica is included with your membership to CASCA. To learn more about CASCA, click here. To learn more about CASCA membership and susbscribe to CASCA, click here. To receive some news from Anthropologica, follow this link. Institutions (libraries and others) can subscribe to the journal directly. Click here for more information and to subscribe online. The journal is published by University of Toronto Press, and is available on the Project Muse. Our aim is to build on our already well-established reputation for publishing and to become one of the top international journals in social and cultural anthropology. We encourage submissions from anthropologists without preference for any single region of the world. We do not restrict ourselves to any particular theoretical tradition. As a bilingual journal, we actively encourage submissions in both French and English from around the world. A typical issue of Anthropologica contains a thematic section on a topic of interest to many of our readers, between three and five volunteered papers on a variety of themes, one or more special features, such Ideas, Anthropological Reflections, and Practitioner’s Corner, book reviews and, from time to time, film reviews and reviews of museum exhibits. The Ideas section was created by past-editor Winnie Lem. It consists of a brief, position paper by a well-known scholar concerning a key concept in anthropology and the social sciences such as “community” and “the state” and short responses by other scholars to that paper. Normally Ideas are between 3500 and 5000 words in length. Anthropological Reflections is a feature created by Jasmin Habib that invites anthropologists to reflect on their experiences in the field in autobiographical and auto-ethnographic pieces, photo-essays, poetry, travelogues, exchanges with interlocutors, experimental writing, etc. The point of our efforts is to broaden the scope of our anthropological writing, publishing and reception. Practitioner’s Corner is the newest feature of the journal which invites anthropologists working outside of academia to share their experiences in their practice as public servants, human rights advocates, museum curators, NGO and INGO workers, lawyers, social workers, teachers, etc. These submissions are between 3500 to 5000 words in length. ALL article submissions submitted to Anthropologica undergo double-blind review, including special features. Book Reviews are subject to review by the Anglophone and Francophone Book Review Editors as well as the Anglophone and Francophone Editors. Our style for references and bibliography generally follows the Chicago Style with Canadian spelling. Anthropologica appears twice a year, usually in Spring and Fall. All Anthropologica submissions, reviews, and editorial work are done through our online peer review management system Scholar One. Note to publishers: to submit a book for review, please contact the appropriate book review editor for a mailing address. The journal is online with Project Muse. However, back issues, including some that are very recent, are republished by Proquest in non-facsimile format. In addition, JSTOR republishes articles that are three or more years old in facsimile form. Individuals may access these electronic resources through subscribing libraries. Furthermore, it should be noted that facsimiles of some back issues may also be obtained by the general public through Google Books.